Take a look at the cutie pie I'm interviewing today...Muesli, the feline star of A Scone to Die For, the very first Oxford Tearoom mystery! My new friend is nice and chatty so let's get right to it! Welcome Muesli, thank you so much for chatting with me today! Could you start by telling us a little about yourself and how you came to spend time at Gemma's tearoom? Hello Mudpie! So nice to meet you! Well, I’m a small grey tabby with a white chest and paws and big green eyes with black eyeliner all around – oh, and a little pink nose! I’m a rescue kitty and I was adopted by a nice human named Fletcher who’s really good at baking yummies. And he works in Gemma’s tearoom, baking delicious English treats like scones with jam and clotted cream. But Fletcher is a very shy, quiet kind of human and he feels braver when he has me around, so Gemma was very nice and she said I could come with Fletcher to the tearoom every day as well! Only… I’m not allowed in the kitchen or the dining room, because the grumpy man from the Food Safety Department said so – I have to stay in the little shop area. Meorrmph! But I want to be where all the people are! I’m a very sociable, smoochy kitty, you see – so I keep trying to escape. In fact, when the story starts in A Scone To Die For, I DID escape – shhh! Don’t tell anybody! – and I was scampering around under the tables, when Gemma saw me and tried to catch me… and then I ran towards that cranky American tourist who had been acting really weird… and… well, you’ll have to read the book to find out what happens next! Well, every morning starts with a nice, big cat stretch! And then I have to meow loudly to remind Fletcher about my breakfast (humans are such forgetful creatures, you know!) – and then when my tummy is full, I settle down for a nice, long wash.
And after that, I’ll go with Fletcher to the tearoom where I keep myself busy getting into mischief! Hee! Hee! Tell us about your relationship with Gemma. It seems a bit complicated since she's not really a cat purr-son. Ooh, yes! Can you believe it – she actually prefers those stinky things called dogs? But I think I’m winning her over bit by bit. She gets a big smile now whenever she sees me and she knows where I like to be tickled under my chin and stroked along my back. I’ve been rubbing myself against her legs a lot too, so now she smells quite nice. And although Gemma doesn’t know it yet, I’m going to be a big help in solving mysteries with her in the future! Haha! That is a funny coincidence about your name! My name is actually from the real-life Muesli who inspired my character in the books. The real-life Muesli is owned by Hsin-Yi, who is the author of the books (she uses the initials of her first name on the covers because it’s a Chinese name and so a bit difficult to pronounce! So “H.Y. Hanna”). And the real-life Muesli got her name because Hsin-Yi & her husband had a Great Dane named Honey and a cat called Lemon as their very first pets. They got Honey and Lemon together as puppy and kitten and wanted a “pair name” – and they liked to name their pets after foods – so they thought of “honey & lemon” – you know, that hot drink you make when you have a cold and it makes you feel better? And then, very sadly, Lemon died suddenly of cat flu when she was only 5 years old and that left only Honey on her own. So when Hsin-Yi & her husband felt ready to have a kitty again, they adopted the real-life Muesli from a rescue shelter – and they wanted a pair name that would go with “Honey” – so they thought: Honey and Milk? Honey and Oatmeal? Honey and Muesli… Yes! They decided they liked “Muesli” as it was a cute and unusual name, and went well with “Honey”! Can you introduce us to the real life Muesli who inspired your character? Hsin-Yi did a lot of training with Honey and they did something called “doggie dancing” (canine freestyle) which is a kind of dog sport, where the dog learns lots of clever tricks which are then put together in a routine to music. Muesli liked to join in with the clicker training that Hsin-Yi was doing with Honey and so she learned lots of tricks too! She will Sit” and lie “Down” on command, as well as “Hi-Five” (or “Hi-Paw” really!) and “Sit Pretty”. And she has very good Recall - she always comes when her name is called – even if she is far away in the garden. Honestly, I think she’s a bit TOO well-trained for a kitty… I mean, we wouldn’t want to give humans any ideas that cats actually do anything they’re told, would we? Oh, but the real Muesli is very shy with strangers, so that’s one place where she’s really different from me. I don’t think she’d enjoy meeting lots of strangers in a tearoom every day or going out to solve mysteries… but that’s OK because she keeps Hsin-Yi company while Hsin-Yi is writing the books and helps her with the plotting – so she’s sort of solving mysteries too! 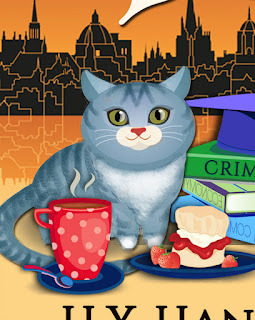 What kinds of trouble do you and Gemma get into in A Scone To Die For, the first Oxford Tearoom mystery? Oh, Gemma gets into LOTS of trouble! 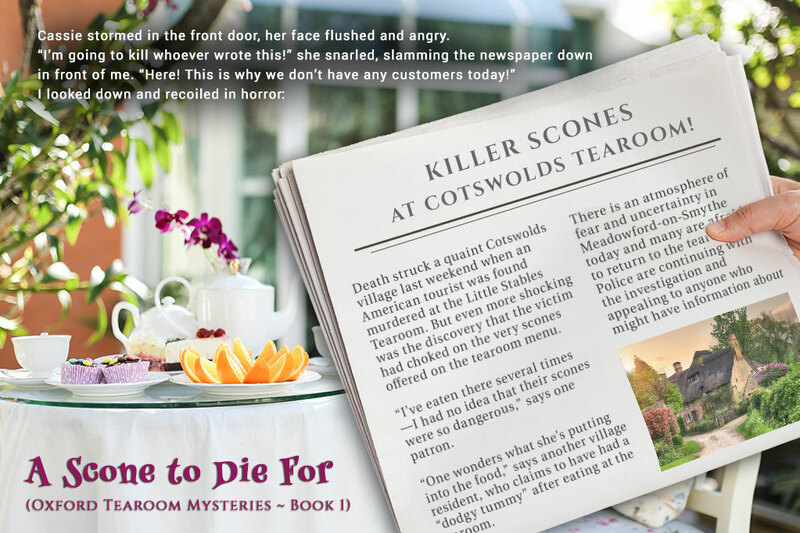 First, she finds that strange American tourist dead in her tearoom – murdered by a scone! And then everybody in the village starts to think that it’s her fault – maybe even that the scones and other yummies in the tearoom might be dangerous – and so nobody wants to come to the tearoom anymore, which is a disaster for Gemma! Because you see, she used up all her money to buy the tearoom and make it nice – and now she has to live back in her old home with her Mummy & Daddy, which makes her a bit crazy. So she really needs her tearoom to do well and get lots of customers… so that’s why she decided to do some snooping herself and try to find the murderer. Oh, as for me… well, I got a terrible scare in the tearoom from that cranky American tourist and then… I did something which made all the humans very worried about me. Everybody was wondering if I would be OK… but don’t worry, you’ll find out at the end of the story! Oh yes! Well, Hsin-Yi has been very busy, you see, and she’s already written Book 2 of the Oxford Tearoom Mysteries. It’s called “Tea with Milk and Murder” and it’s out now already as well. So if you enjoy Book 1, you can dive straight into Book 2 – and boy, do I have some really exciting adventures in the second book! I’m sort of like the star of the book – hee! Hee! It’s a very intriguing poison murder mystery and Gemma would never have been able to solve it if it wasn’t for me and my (naughty!) antics. She does get herself in to a very sticky situation, though – but don’t worry, I just might save the day! Thank you so much for having me – I’ve really enjoyed chatting with you! From the publisher: When an American tourist is murdered with a scone in Gemma Rose’s quaint Oxfordshire tearoom, she suddenly finds herself apron-deep in a mystery involving long-buried secrets from Oxford’s past. 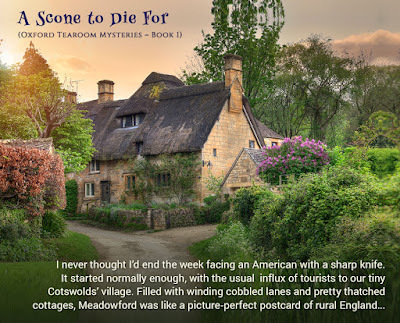 As an avowed Anglophile, the Oxford Tearoom mystery series is as irresistible as one of the delectable scones sold at Gemma's Little Stables Tearoom. The quaint tearoom is located in Gemma's hometown, Meadowford-on-Smythe, where she has returned after leaving her executive job in Sydney. She dislikes living with her parents again, but knows she needs to make a success of her new business in order to regain her independence. With the help of her best friend Cassie, who waits tables, and her amazing chef Fletcher, Gemma's future seems to be looking bright. Then an unbelievably rude and crass American shows up one day and tempers flare. Gemma is able to successfully diffuse the situation, but is horrified to find him waiting for her the next morning in the tearoom's courtyard. It's worse than she thinks...he's dead, and one of her scones is crammed in his mouth. Gemma sees her dreams going up in smoke unless she's able to nab the killer. It doesn't prove to be very easy, though. The lead investigator is her old flame, and he doesn't appreciate her interference, even though she has insider knowledge of the victim's academic background. Gemma is also forced to deal with her mother's matchmaking mission (and inability to remember her iPad's password) and a quartet of little old ladies who are also determined to solve the mystery. And where on earth has Muesli, the tearoom mascot, run off to? The identity of the killer was quite a surprise, although I should have seen it coming since I totally predicted what ended up happening in the Epilogue. Cryptic, aren't I? Trust me...if you're a cat lover or a fan of British mysteries, you absolutely must read A Scone to Die For. I just wish book 2, Tea with Milk and Murder, was available right now!!! Another great interview!! I would love to win this book!! 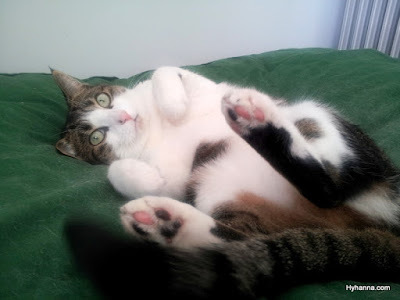 Terrific interview with Muesli the cat. 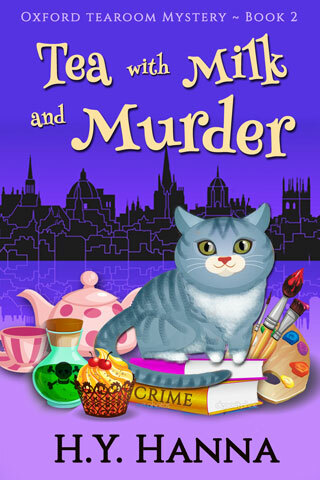 I love English cozy mysteries. I tried to enter the giveaway but it came up a closed $50 Amazon g card, not the book giveaway...eek. I tried it from both the email & the blog,I got the same results. I'm using an Android phone. I just love these interviews and book reviews, Mudpie and Melissa! You sure know how to pick the best material. Purrs! 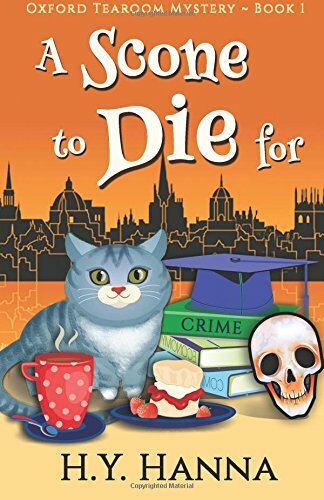 Mum would love to read 'A Scone to Die For' if she gets a chance to win a copy of your book. Love the kitty Musli. She looks like a dear kitty of mind named Tangie who now lives in Heaven with many other of my kittens which I've had over the years. Your book sounds really cute. 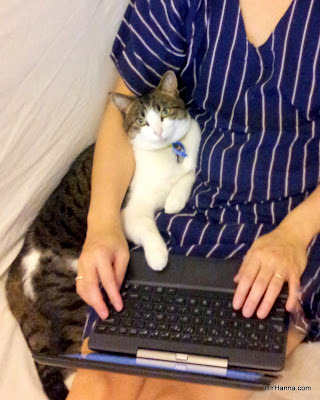 I also write cat mystery with three at Amazon, though my kitty is a Tuxedo. Black Cat and the Lethal Lawyer to name one. Good luck with your series. What a charming interview and I love tea and tearooms and scones...thank you for the Contest..I love the British mysteries. Muesli is adorable! And the series sounds like a great read, too. My trio of felines love nothing more than a chance to cuddle while their mom reads a mystery by the fire! Yummy! This was a very intriguing interview. Look that it was from the cat's perspective. Would really enjoy reading. It's always entertaining to stop by and read what's going on here. Thanks for the opportunity to win a book. Great interview and adorable photos. Enjoyed reading this and seeing the photos. Always an interesting read. Thanks. Someone’s flirting with you, MP. Are you ready for this. We enjoyed this interview and photos! The book sounds like a wonderful read too! Mudpie that was a great interview. I love your interviews, Mudpie. And I'll have to look for this author when I next go to the bookstore. Fun interview; sounds like a great read with an eclectic group of characters. Would be fun to win, thanks for the opportunity. Great interview. Love the pictures of the real Muesli. Adorable. Would love to win a copy. I love that your cat inspired this book! 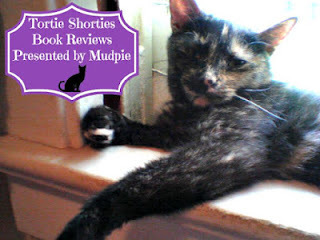 My niece loves cats and I am sure would love to read this! Too late for the book giveaway, but what a great interview. Will have to get a copy and read it. I've really enjoyed reading the entire post, thank you! What a lovely interview, MudPie! (Tell your mom I liked the review, too.) You and Muesli sure found a lot to talk about! As an English person,I quickly discerned that this book was not written by another English person. Americanisms would slip into the writing but I could see the book passing muster as a so called English tale,being sold to the American market. Having said all this, I am enjoying it. I found it through kindle unlimited and have down loaded the others in the series. If Y H Hanna ever reads this review, please can I offer my services as a beta reader. I would be delighted to point out what phrases the English are likely to use or not use, when speaking to each other or narrating a story. It would help to add authenticity.